If you love to answer the call of the wild and enjoy regular outdoor camping trips, but you are also one of those people that really need their sleep, then the thought of having to pitch your tent and throw down your sleeping bag on a bumpy surface probably fills you with dread! Whether you are going solo or like to sleep as a pair, there are camping cots designed to give you a good night’s sleep with single and double versions available. We’re going to take a look at three best camping cot recommendations in our comprehensive product review today. 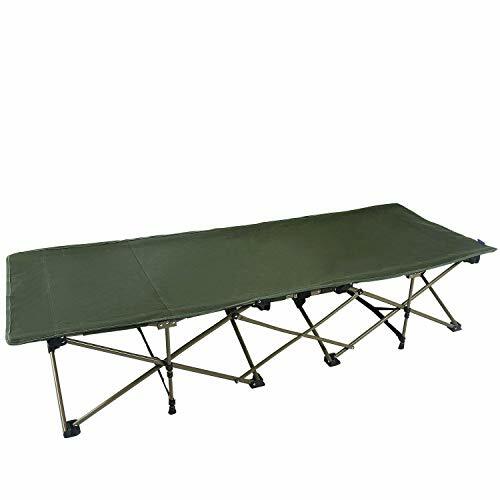 A camping cot doesn’t mean it’s a bed for an infant; a cot is also known as a camping bed and is usually characterized by looking like a US army-style gurney. A camp cot is definitely not an air bed which again goes directly on the ground. Depending upon the conditions of where you are sleeping (perhaps directly under the stars on a rainforest adventure). then the elevated sleeping position that a camping cot delivers is most definitely going to be advantageous and assist in providing a restful night’s sleep. No-one wants a forest creature climbing into bed with them! The best camping cots should be lightweight, compact, portable and of course comfortable so that you wake up happy and well-rested and ready to take on the day ahead. So let’s jump right in and review three of the best camping cot contenders. For the ultimate in camp comfort, the Teton Sports Camp Cot allows you to experience not quite the comfort of your own bed but certainly a good night’s sleep, even in the great outdoors. The great thing about this particular model is that it is so easy to set up. So simple in fact, even your child could do it! That’s thanks to a patented pivot arm design with a built-in lever that makes putting all the bars securely into place a breeze. 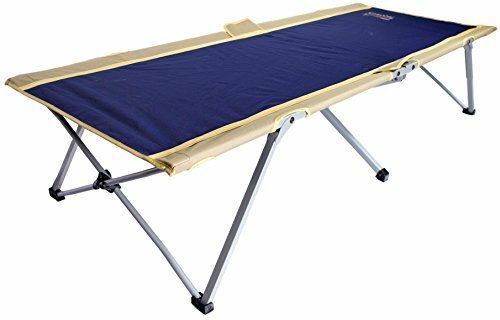 It’s a perfect, quick and easy to assemble, fully portable, outdoor bed. The patented frame system does the hard work so you don’t have to worry about the assembly, plus its super sturdy so you won’t go bump in the night. 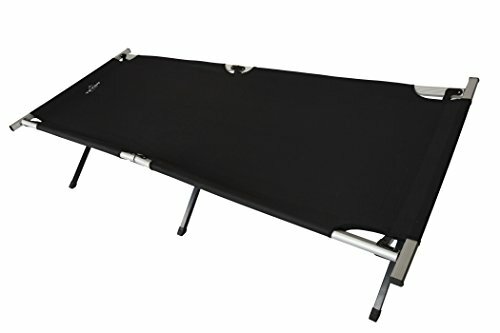 It creates a tight and securely stable, comfortable sleeping surface, thanks to those reinforced steel X-legs that are fully folding for easy portability. Take the comfort of home with you outdoors with the Teton Sports Cot and never sleep on a rocky surface again. 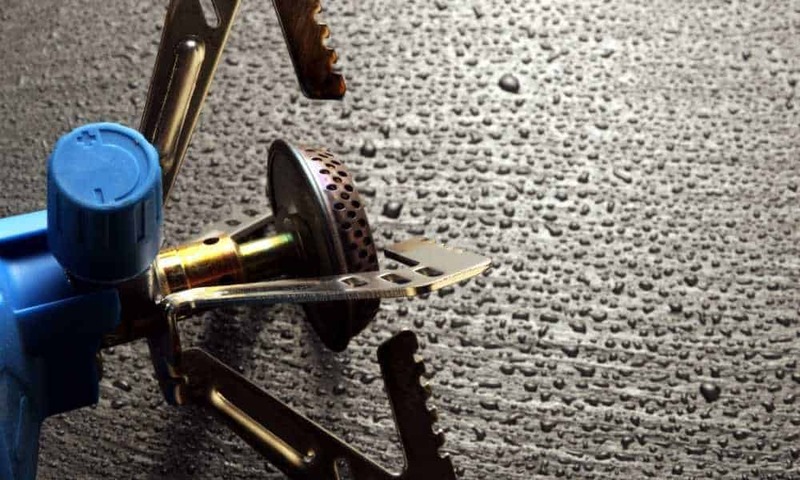 Byer of Maine firmly believes that just because you are camping doesn’t mean that you have to suffer an uncomfortable night’s sleep. Their Easy Cot proves that outdoor adventuring and comfort can go hand in hand. This model comes with its own travel bag so it’s perfectly portable and should take no longer than 60 seconds to set up. You probably would take that long just to unroll your sleeping bag and put it on your groundsheet. It’s a roomy and full sized, large cot that comes in at 6 ½ feet long and 31 inches wide, plus it’s raised 18 inches from the ground so you will feel like you are tucked up at home in a regular bed! It can hold up to 325 pounds of body weight yet it only weighs 20 pounds itself so is great to throw in the back of your truck for a weekend away. Solidly constructed too, it’s a great choice, although doesn’t have locking legs like some of the other more expensive models but it still holds up well. It’s also made of durable quality 600D nylon, and there are no cross beams to dig into your back while you sleep, meaning that you really should have a great night’s sleep. Strong and durable holding up to 330 lbs. Redcamp is known for producing quality outdoor equipment designed to make your experience more pleasurable, and this is a cost-effective and high quality, portable cot that you will get plenty of use out of. It could not be quicker or easier to set up and literally folds out flat in little more than 10 seconds. It offers balanced support for your entire body and is ergonomically designed to provide extra comfort where you require it most. The hand and neck area is angled, so you’ve no need to bring your pillow from home. It’s also sturdy and durable construction on a reinforced triangle frame and features their patented G-STA holder system. Whether you are at home and have guests coming so need an extra put me up bed, or are heading on a camping adventure, this is a quality choice. If you are looking for an extra bed for home for when you have additional guests, or you enjoy camping but want to ensure that you get a good night’s sleep and aren’t troubled by uncomfortable and uneven ground conditions, then all three of these camping cots would make a wise investment and are reasonably budget friendly too. They offer secure and stable sleeping conditions even if you are of a heavier frame and build and all come with travel bags so that they can easily be packed up and go with you wherever you venture. Be prepared to say goodbye to rough outdoor sleeping conditions and hello to a restful night’s sleep in camp!